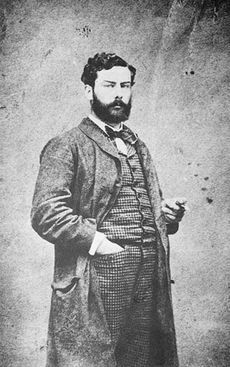 Alfred Sisley (1839-1899) was born in Paris to affluent English parents. This English impressionist painter spent much of his life in France. 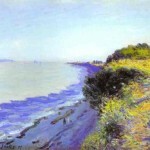 Painting, for Sisley, begain as a hobby – a rich son’s way to pass the time. He studied with the Swiss artist Marc-Charles-Gabriel Gleyre. 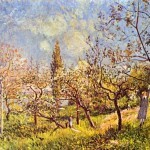 Sisley was friends with Frederic Bazill, Claude Monet and Pierre- Auguste Renoir. They painted landscapes en plein air (outside) in order to capture the natural sunlight in their paintings. Their work was unlike what was commonly being done at the time and was often rejected by juried art exhibitions. During the war in 1870, his family lost much of their wealth and with the death of his father, Sisley found himself with a wife and child and no means of support. His hobby now became a way to provide for his family. 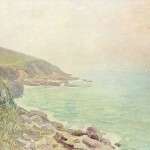 Impressionism never really gained a following during his lifetime and he lived the remainder of his life in virtual poverty rather than concede his vision to more popular techniques. Monet and Sisley held several sales of their work which yielded for Sisley not much more than enough to pay his auction expenses. Sisley lived in the French town of Moret sur ​​Loing from 1880 until his death. He had applied to become a French citizen in 1898 but died before it would be approved. 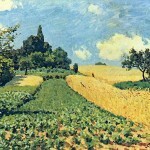 The farming community of Moret sur Loing inspired works by Sisley as well as Monet and Renoir. Moret sur Loing offers cultural tours of the places Sisley captured on canvas. 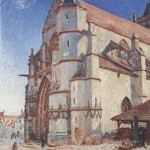 The Church at Moret is one of their most recognizable landmarks and is the subject of several of Sisley's paintings.